Indubitably, the cryptocurrency market has caught the attention of investors and traders, who are engaging vigorously due to its volatile nature. The crypto market has reached a market capitalisation of ca. $400 billion, half of which is in Bitcoin ($140bn) and Ethereum ($70bn). Crypto markets are affected on a large scale by regulatory and sentiment factors, which makes technical analysis desirable, hence many CTAs that apply such techniques have added cryptocurrencies in their trading portfolios. 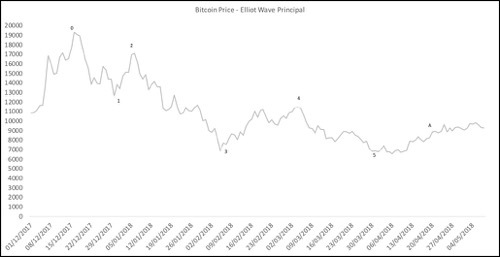 One of the theories that could reveal patterns is the Elliott Wave Principle, developed in the late 1920s and believing that the swings of market psychology appear in similar repetitive patterns, which Elliot classified as waves. The waves were essentially the consistencies of investors’ reactions to external factors. Despite the principle’s popularity, its difficulty to be applied should be stressed out as investors attempt to analyse the patterns. 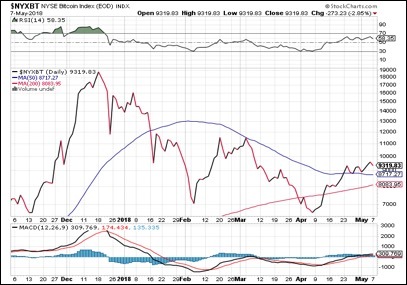 The divergence in opinions about the Bitcoin’s price projection highlights the predicaments in applying theories and considering the unregulated nature of crypto markets all theories may lead to a worth of zero. The main and biggest issue that technical traders face is defining the duration and length of the first wave and then to apply the rules, therefore many traders that analyse the same horizon may end up with different signals. The other hurdle is the applicability of the principle in cryptocurrencies. This perspective will consider it applicable due to the sentiment driven Bitcoin, although this may change in the future with the inclusion of more computerised trading. For the purpose of this perspective, we will examine different time horizons and the most recent crashes and rallies of the Bitcoin price. 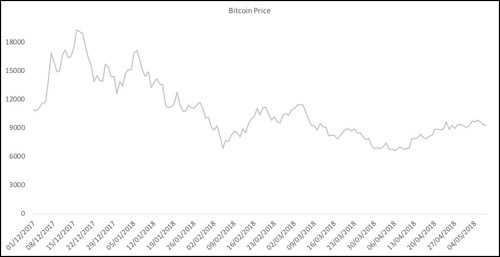 Starting from 16 December 2017, when the price was $19,343, we can observe a downward trend to the price of Bitcoin, which is evident in Figure 1 below. Applying the principle to this downward trend for a longer period of time, the price should be heading towards wave B, which is close to $7,000 before transitioning to wave C in $9,100. If we start analysing from the 6th April 2017 and define it as a starting point of an upward trend according to Figure 1, then we are still on wave B, with a projected price of $9,517 before jumping on wave C and reaching $9,000. In both cases, the price after the completion of wave C would be around $9,000. The results will depend on the horizon you are looking and the timing of waves, so the above results can only be illustrative of the Elliot Waves Principle application. Applying the principle since Bitcoin’s inception, we observe that the price does not stay within boundaries for the second and third wave, as well as wave A, meaning that drawdowns and rallies may last longer than expected. In this case, we are moving towards wave C at $8,660. Using other techniques such as RSI and MACD, there is a very bullish view on the price, indicating that at the moment the crypto currency is oversold. Using different tools, horizons and datasets when trading Bitcoin should consider the risky nature of the asset class. The debate around being a bubble or an established asset class is not over, and no one can project its value. The different views definitely underline the heterogeneity of the markets and the potential further growth of the market. With more institutional backing, the crypto market will evolve into something completely different. More liquidity, trading volume and regulations may transform the asset class in addition to more derivatives like futures, options, CFDs and ETFs/ETNs. Currently, institutional investors consider crypto currencies similar to venture investing, which means that a longer-term view could be more appropriate. The development of more products will definitely allow crypto markets to grow. Several of the biggest banks that were initially opposed to Bitcoin, are now offering services that facilitate its trading with the most recent example being Goldman Sachs opening Bitcoin trading operations. 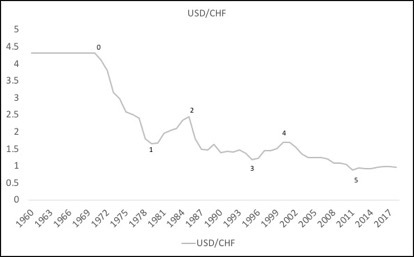 Taking a longer-term view at the currencies market and specifically the U.S. dollar against British Pound Sterling and Swiss Franc, we can easily observe trends, and the application of Elliot Waves Principle can prove itself inspirational for trading but as we are taking into consideration past data and different economic environment, they should not rely completely on the principle. 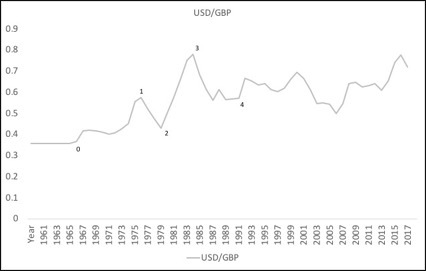 For the USD/GBP pair, the theory suggests that the markets are on wave 5, which peaks at 0.87, while for USD/CHF the principle suggests that we are currently past wave 5. In this perspective, we utilised the Elliot Waves Principle as a tool to view crypto markets on a shorter and longer period of time, considering all the predicaments around the principle as outlined in the analysis above. It is easily observed that different starting and ending points conclude to different results regarding the phase of the cycle and the price range, bullish and bearish signals, but nevertheless it is a useful tool to analyse markets that are largely driven by sentiment. Stone Mountain Capital is an advisory boutique established in 2012 and headquartered in London. We are advising 30+ best in class single hedge fund and fund of fund managers across equity, credit, and tactical trading (global macro and CTAs). In private equity and private debt, we advise 10+ general partners across the sectors real estate, infrastructure / real assets and capital relief trades (CRT) by structuring funding vehicles, rating advisory and private placements. As per 17th January 2018, Stone Mountain Capital has total alternative Assets under Advisory (AuA) of US$ 51.1 billion. US$ 48 billion is mandated in hedge fund AuM and US$ 3.1 billion in private assets (private equity / private debt) and corporate finance. Stone Mountain Capital has arranged new capital commitments of US$ 1.15 billion across hedge fund, private asset and corporate finance mandates. Any business communication, including the content of this research perspective, sent by or on behalf of Stone Mountain Capital LTD or one of its affiliated firms or other entities (together "Stone Mountain"), is confidential and may be privileged or otherwise protected. This e-mail message is for information purposes only, it is not a recommendation, advice, offer or solicitation to buy or sell a product or service nor an official confirmation of any transaction. It is directed at persons who are professionals and is not intended for retail customer use. This e-mail message and any attachments are for the sole use of the intended recipient(s). Our LTD accepts no liability for the content of this email, or for the consequences of any actions taken on the basis of the information provided, unless that information is subsequently confirmed in writing. Any views or opinions presented in this email are solely those of the author and do not necessarily represent those of the limited company. Any unauthorised review, use, disclosure or distribution is prohibited. If you are not the intended recipient, please notify the sender by reply e-mail and destroy all copies of the original message and any attachments. By replying to this e-mail, you consent to Stone Mountain monitoring the content of any e-mails you send to or receive from Stone Mountain. Stone Mountain is not liable for any opinions expressed by the sender where this is a non-business e-mail. Emails are not secure and cannot be guaranteed to be error free. Anyone who communicates with us by email is taken to accept these risks. This message is subject to our terms at: www.stonemountain-capital.com/disclaimer.